PCOS High Fibre Recipes, Polycystic Ovary Syndrome high fibre recipes. Fibre helps in lowering blood glucose levels and is especially beneficial in a PCOS diet where it helps in combating insulin resistance by slowing down digestion. Fibre helps provide roughage to the system to speed up the passage of food and to prevent constipation. It keeps you full for long hours and avoids unnecessary bingeing. • Veggies and greens: Vegetables like carrot, capsicum, pumpkin and tomatoes, and green leafy vegetables such as spinach and fenugreek contain a high amount of fibre and nutrients. They are low in calories and can be had in the form of salads or subzis. Try recipes like Masala Cauliflower with Green Peas, Cauliflower greens methi palak sabzi recipe, suva palak methi sabzi recipe and Mushroom and Green Capsicum Subzi. • Nuts and seeds: Consume fibre-rich nuts and seeds such as flaxseeds, chia seeds, walnuts, almonds and pistachios. Try yummy and healthy treats like the Flax Seed Crackers with Beetroot Dip, homemadde almond butter recipe, homemade almond bread and Kokum and Chia Seed Drink. • Wholegrain flour: Go for whole wheat bread and products made of whole wheat flour instead of eating products like white bread and naans, which are made of maida. Looking for a whole wheat snack recipe? Try Whole Wheat Methi Khakra. However, add bread to your diet only occasionally. • Wholesome cereals: Try including cereals such as oats, barley, jowar, bajra and broken wheat instead of white rice to ramp up your intake of fibre. Kickstart your day with a fibre-rich breakfast of Jowar Upma or Jowar and Vegetable Porridge. Opt for bajra cauliflower roti recipe, jowar bajra spring onion roti recipe, jowar bajra garlic roti recipe or jowar bajra besan thalipeeth recipe . • Fruits: Fruits are full of nutrients and antioxidants and are important in a PCOS diet. Consume whole fruits such as apple, pear, chickoo and guava with the skin, for your daily dose of fibre. You can also have fruits in the form of smoothies or juices. You can also try a mix of vegetables and fruits like the Palak, Kale and Apple Juice, carrot tomato beetroot juice and carrot spinach black grape juice. • Baked products: Tasty though they are, cookies, biscuits and pastries are up to no good as they contain a high amount of sugar, maida and saturated fats like butter, with no fibre at all. • Highly-processed flours and grains: Avoid eating white rice and white bread. • Strained juices: Avoid straining juices because that will remove the fibre. Try consuming unstrained juices along with the fibre, or eat a whole, unpeeled fruit like apple, pear or guava. 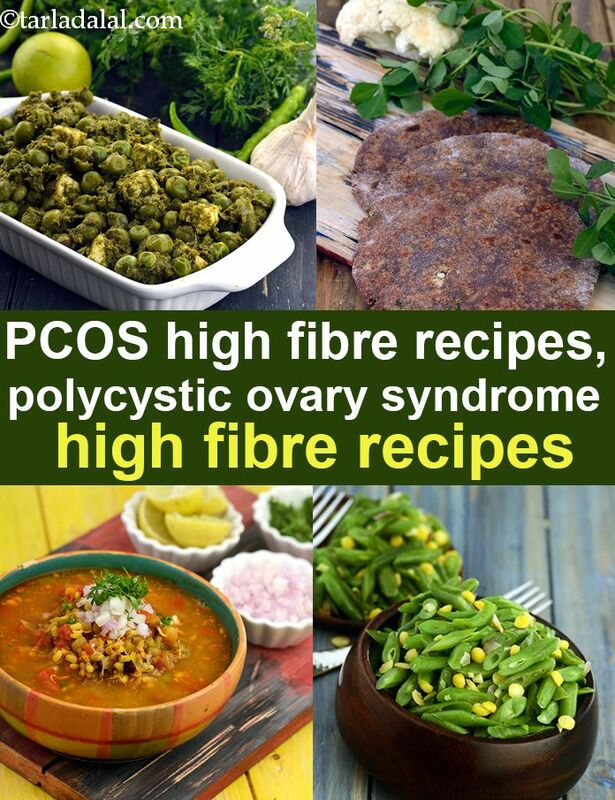 Enjoy our PCOS High Fibre Recipes, Polycystic Ovary Syndrome high fibre recipes and other PCOS recipe articles below.